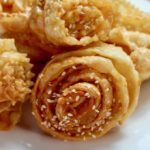 Samsa is a very popular Tunisian pastry, just as popular as other famous North African pastries like debla, makroud, yoyo, griwech, zlabia, or harisset el louz. There is still some controversy as to the origin of samsas. Some say with confidence that this is an Algerian pastry. Others will say with patriotism that this is a Tunisian specialty! 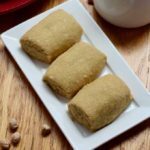 Let us all agree: samsas are almond-based North African pastries that are very popular during the festivities of Ramadan. What makes them special? Their crispy exterior and the honey syrup with a wonderful taste of orange blossom water. And since we are featuring Tunisia this month, I tested the Tunisian version: almond samsa with brick sheet dough. 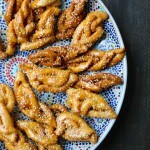 If there are two Tunisian pastries that remind me of childhood, I would say without hesitation samsas and graiba homs. No, I am not Tunisian! But our nanny and second mother Najoua prepared those regularly, and brought trays of them for Eid el-Fitr. You can imagine the happy dance that my brothers and I improvised when we discovered the trays garnished with these delicious pastries! Eid el-Fitr marks the end of the Ramadan, and is celebrated on the first day of the month of Chawwal. 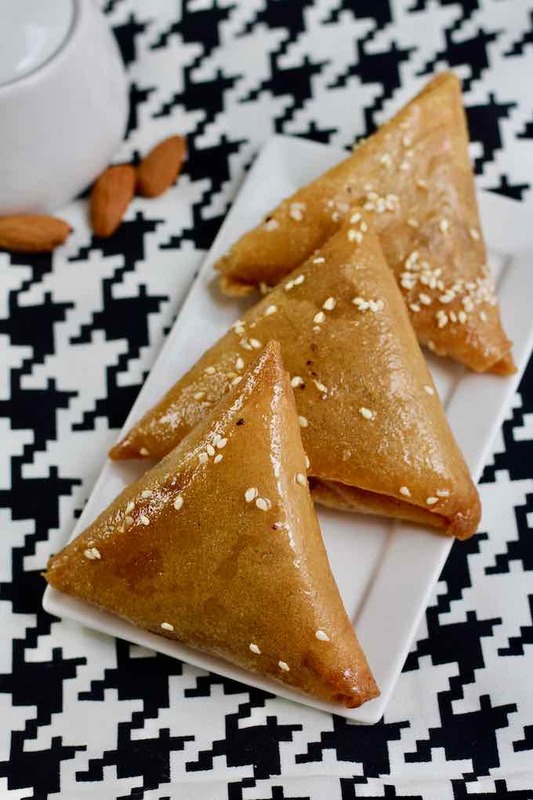 Samsa is a triangular-shaped almond-based Tunisian pastry. After the almonds are toasted and ground, they are mixed with sugar, orange blossom water and cinnamon to make the filling. The proportions are not very well defined, and everyone is free to adjust according to their tastes. In North Africa, people still use the undefined measures of “glass”, “bowl” or “handful” that vary from one woman to another, hence the approximations of some recipes. The result varies from one time to the next. North African pastries are somewhat forgiving and that may be what makes them so delicious! Then the pastries are deep-fried until golden brown. 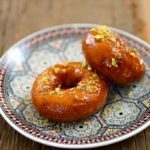 After being thoroughly drained, they are soaked in a syrup flavored with honey and orange blossom water, then sprinkled with sesame seeds. There are many ways to prepare samsas in North Africa. The dough used for Algerian samsas is very similar to the dough used for griwech: they are hard and crispy. In Tunisia, people use the same very thin brik dough sheets that are used for savory recipes like tuna briks. The sheets are stuffed with a preparation of ground almonds, orange blossom water, butter and sugar. Spices like cinnamon, nutmeg and cloves are added. 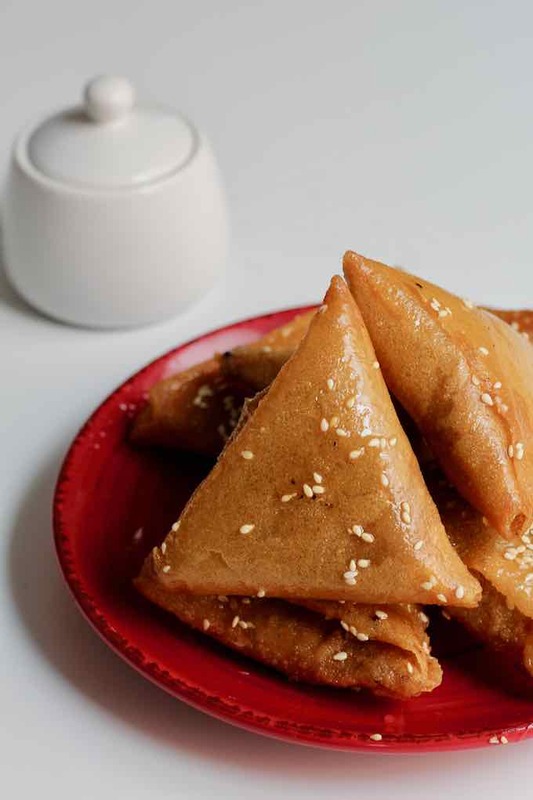 In some parts of Tunisia, it is common to prepare samsas with ground hazelnut and ground and roasted sesame: this version is called samsa bel jeljlen. Some pastry chefs have let their imagination and culinary creativity go wild lately to make some of the most delicious samsa variations. I had the opportunity to enjoy some with pistachio and hazelnut. 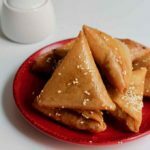 These delicious triangles were then dipped in a sugar syrup perfumed with rose water. A true delight! Yes, samsas have cousins! In Morocco, people call them briouate (briwate or briwat). 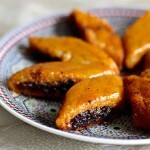 The almond briouates are quite similar to Tunisian samsas. 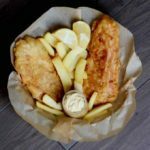 However, there is also a savory version of briouate where the filling varies according to the regions and local products. In Asia, samsa takes the name of samosa which is served as a savory appetizer. Samosa is native to India and Pakistan. The filling is mainly made of vegetables, meat, hot pepper and spices including coriander and turmeric. 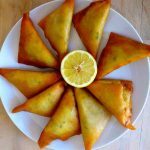 In Uzbekistan, Kazakhstan and Kyrgyzstan, samosas are almost always cooked instead of being fried. 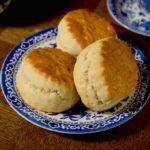 The dough can be a simple bread dough or a pastry dough. In Lebanon, Syria, Jordan and Israel, people talk about samboussak (or samboussek). The triangles are savory, prepared with tomato sauce, chard, cheese or meat and are baked in a traditional oven called taboun. In the Middle East, you’ll enjoy fatayer, a triangle of bread dough filled with spinach, cheese or minced meat. On Reunion island, if cheese samosas are very popular, it is not uncommon to find samosas with shark and pineapple. In the streets of Madagascar, traditional sambos are sold. 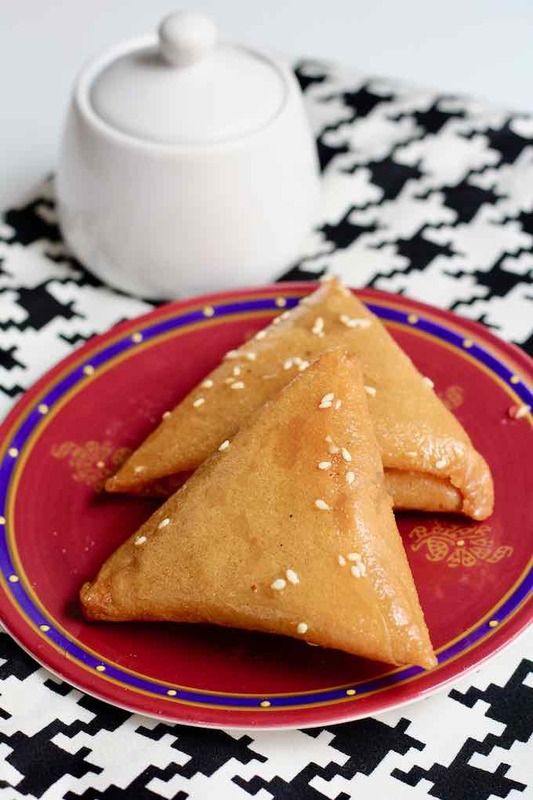 If the folding technique of these delicious North African pastries may be intimidating, rest assured that you’ll get a hang of it in no time. So, who’s ready to make those mouth watering delicacies? Show us your edible origami masterpieces! Samsa is a Tunisian triangular-shaped almond-based pastry. 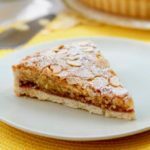 After the almonds are toasted and ground, they are mixed with sugar, orange blossom water and cinnamon to make the filling. Pour the sugar into a saucepan and barely cover it with water. Add lemon juice and orange blossom (or geranium) water. Put on low heat and, and using a wooden spoon, stir once (not more), when the sugar comes to a boil. Simmer gently until reaching a temperature of 220 F (about 20 to 30 minutes). When the sugar reaches a temperature of 195 F, incorporate the honey and stir the pan by holding it by the handle (do not stir with a spoon). Lightly roast the almonds and grind them to a powder. Mix almonds, ground clove, cinnamon, sugar and vanilla. 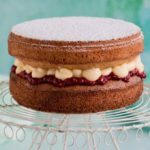 Sift the icing sugar over and mix well. Add the orange blossom water (or geranium water) and butter and knead until you obtain a homogenous paste. 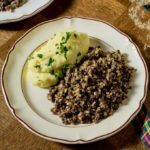 Take about a teaspoonful of the paste, and shape balls. Cut each round sheet of brik dough into two equal parts. Fold a half sheet, placing it in front of you vertically, the rounded side to the left. Fold the sheet on itself, with the rounded corner towards the right edge. Press a little along the fold. In the lower left corner, drop a ball of stuffing. Take the lower right corner and fold to the left. Gently take the formed triangle and fold it to the right along the fold. Take the triangle again and fold it to the right along the fold. Fold the top right corner down to form a point. Take the tip thus formed and return it under the fold of the sheet (like an envelope). Once the flap is fully folded, the triangle is formed. Heat a large deep saucepan with oil. Fry the samsas over medium heat, turning occasionally until golden brown. 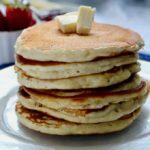 Take them out and place them on a plate lined with paper towel. Soak the samsas as they are still hot (but not piping hot) in the syrup. Then, place them on an oiled parchment paper to cool. Sprinkle with sesame seeds or crushed pistachios. Wait until they are completely cool to store them in a metal or glass container. Keep them in a cool place. To get a nice golden color without burning, prepare raw carrot sticks and place one or two pieces in the oil. Regularly change the pieces of carrot while frying the samsas. You can freeze the samsas once cooled. The syrup can be refrigerated. Once out of the freezer, the samsas can be dipped into the warmed syrup.